COLLABORATE, the annual conference presented each year by the OAUG, IOUG and Quest, provides the opportunity to reflect on key changes in the Oracle ecosystem and allows the users groups to engage with their constituents about the areas of greatest importance. 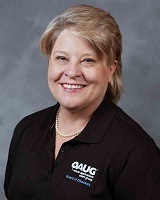 With the COLLABORATE 16 conference now behind her, Dr. Patricia Dues, the new president of the OAUG (Oracle Applications Users Group), talked with DBTA about what OAUG members are concerned with now and how the OAUG is helping them address emerging challenges. COLLABORATE 16 wrapped up a few weeks ago. What were some of the key takeaways from this year’s event? Oracle is moving applications and database technology to the cloud as an option for customers, but a hybrid of a combination of on-premises and cloud is an approach fully supported by Oracle. Oracle is also fully aware of security concerns regarding cloud, big data, and mobility and is working to ensure that customer concerns are being effectively addressed. Another key takeaway is that cognitive computing is a growing field of interest with many of its features being incorporated in future applications. So much of what we continue to hear from Oracle is exciting because it gives customers so many options and increased flexibility in choosing how to obtain functionality from their applications. For example, we’re already seeing members beginning to use certain Oracle Cloud solutions alongside their existing installations. I’m a little biased, but I think it’s so valuable to leverage your user group connections to learn about what’s available. The OAUG’s most important role is to help our members gain access to information that can help them through the journey by evaluating options, connecting them with others who have experience, developing a plan, providing best practices on implementation, etc. Even if you’re not using cloud or other emerging technologies today, I encourage Oracle customers to stay informed. You’ll be in a better position to make decisions and move forward when the time is right. What were the sessions at COLLABORATE 16 that OAUG members were most interested in? Dues: Members enjoyed the Learning Journeys, which consisted of four pathways through the conference designed to guide them through cloud, mobility, security and big data. We also hear they liked the Power Hour, which were longer sessions directed by the audience and encouraged collaboration and idea generation. The Explorer Series seemed to also pique many attendees’ interests. That convened several speakers to deliver an in-depth look at a topic across multiple individual sessions. The Exploration Series consisted on three parts: Approvals, Master Date and International operational differences in Oracle E-Business Suite (EBS) (presented by the German User Group - DOAG). The Women in Technology luncheon and panel discussion was also very popular, and it drew in more than 550 participants. On the Monday of the show, Heli Helskyaho, Oracle ACE director and CEO of Miracle Finland, recounted her unexpected journey charting a career path in Oracle Technology. On that Wednesday, a panel of accomplished women in the technology field shared their personal experiences and fielded questions from the audience. There were also sessions and networking opportunities catered to the young Oracle user professionals. A panel discussion, Make Networking Work for You, offered great tips for those who are just starting their careers or looking to advance their knowledge in the field. And these younger professionals enjoyed the cocktail meetup where they could put these networking tips to use. It seemed like much of the agenda centered around four key themes of cloud, security, big data, and mobility. Why do these themes seem to resonate most with Oracle users today? Dues: The OAUG surveyed its members to understand the top-of-mind issues facing the majority of our membership, and these four key themes were the issues they struggled with the most or found to be the most challenging in today’s environment. These key areas complement each other as technology leaders try to meet the ever increasing demands of data transparency, lower operating costs, increase database complexity and size, plus provide customer and employee mobile access to applications and web sites. What is the OAUG doing specifically to respond to some of these key themes? Dues: The OAUG is helping our members gain access to information involving these four key areas that can help them through their journey by evaluating options, connecting them with others who have experience, providing best practices on implementation, etc. The OAUG does this through a wide range of activities including conferences, eLearning sessions, a comprehensive white paper archive, publications, geographic and special interest groups. For instance, to specifically respond to the cloud, the OAUG formed the OAUG Cloud ERP Special Interest Group (SIG), which brings members and experts together and promotes shared insight into Oracle ERP Cloud for its participants and facilitates feedback from the user community back to Oracle. The OAUG Cloud ERP met at COLLABORATE 16 and plans to meet again at Oracle OpenWorld 16. In addition, the OAUG supports a Big Data SIG, plus other special interest groups that focus on application and system security and mobile access. How is the role of the OAUG changing as Oracle increasingly points to the cloud as the way forward? Dues: The OAUG is responding to members’ interest in cloud through increased cloud-related eLearning educational sessions, whitepapers, etc. The OAUG formed the OAUG Cloud ERP SIG and is also forming another cloud-related SIG in the near future to address additional complexities behind the cloud. The OAUG will also rely on the OAUG Customer Support Council’s influence to help members realize a full return on investment as they move toward or implement Oracle Cloud Solutions. The OAUG Customer Support Council is made up of applications users who provide collective feedback directly to Oracle regarding existing support services and influence the development of new support resources. The council also informs members of trends, resources and best practices in working Oracle Support. How are you following up on these areas in the coming months? Dues: We will soon launch our Best of COLLABORATE 16 – OAUG Forum webinar series which will include the highest rated sessions from the conference presented live via webinar. This is for those who may have missed attending or for those who wish to have a refresher on some of the top sessions. In the fall, after OpenWorld 2016, we will be holding an OAUG Connection Point – Hyperion Online event. This is a very popular online conference that will provide attendees with sessions focusing on many of the upcoming changes in the Hyperion community of applications. What do OAUG members hope to gain from OpenWorld 2016? Dues: The OAUG coordinates with Oracle to develop and present OAUG members’ whitepapers at events, such as the annual Oracle OpenWorld conference. I think members will certainly be interested to hear from Oracle the next steps and advances that have occurred since COLLABORATE 16 in April. Five months isn’t that long, so there will surely be some new things to learn about things like the cloud, big data, mobility and security. OpenWorld also features customer-facilitated educational sessions. The OAUG coordinates with Oracle to develop and present OAUG members’ white papers at the conference. Our members always like learning about what other members have implemented in their own environments ¾ especially the challenges and successes.